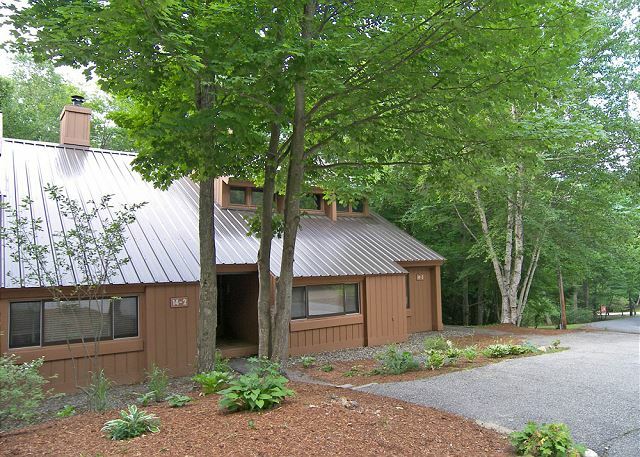 Enjoy a stay at this two bedroom with loft, two bath townhouse located in the heart of New Hampshire’s White Mountains. On the entry level of this townhouse you will find a bedroom with a queen size bed and a full bath located just outside the bedroom door. 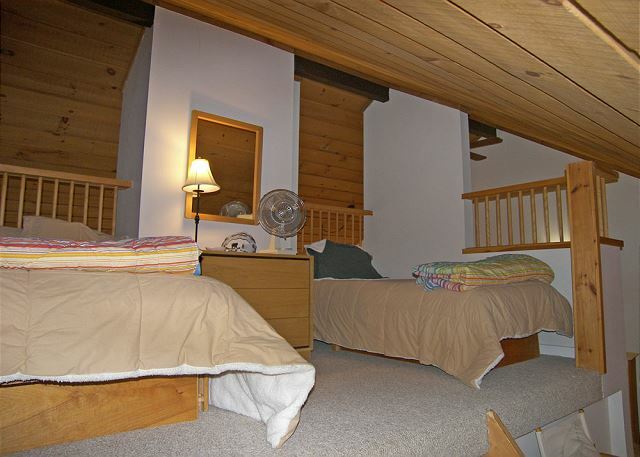 Downstairs is the master bedroom suite with a queen size bed, a set of pyramid (twin/full) bunk beds, a private bath and laundry closet with stacked washer and dryer. The main living level is found above the entry level. 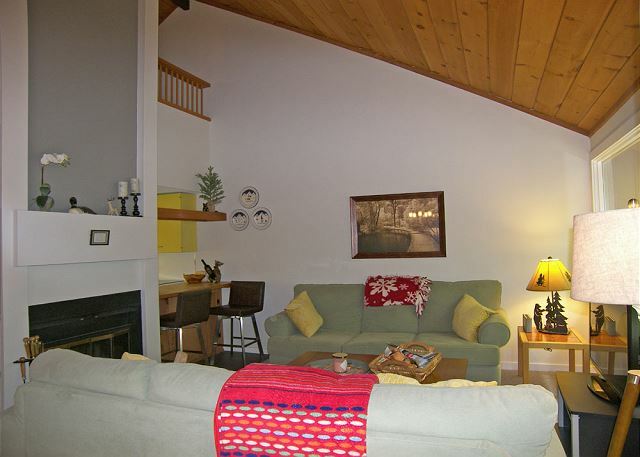 The main living level holds the full kitchen with microwave, dishwasher and counter seating for two; dining area with seating for six to eight; and the living area with flat screen television and wood burning fireplace.The deck with wooded view is also accessed from the dining area on this level. 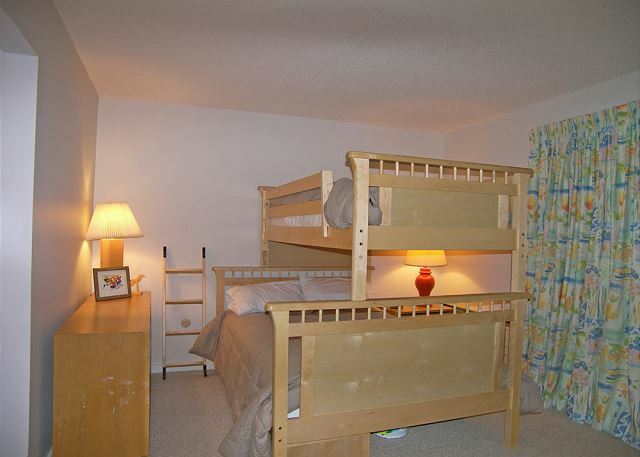 The sleeping loft with two twin beds and a full bed is located on the upper-most level of the townhouse. Second trip to same house - dog friendly; great location - very pleased with the accommodations! Remember to pack towels for the pool otherwise you need to rent them for a $1.00 each/per pool visit. The house was very appropriate for a winter vacation getaway. Lots of sleeping space. Very pet friendly but some dog hair around the house. We appreciate your comments. The dog hair has since been removed, and a different housekeeping company hired to ensure that doesn't happen again. We're glad that you enjoyed the space though, and hope to see you here again! The rental was nicely decorated and couches and beds were comfortable. Although this was a pet friendly rental, it did not appear that it had been vacuumed prior to our stay. There was dog hair everywhere. The hair ended up on our food plates and in glasses. A good vacuum and use of a lint brush would have made a difference. The kitchen floor had not been cleaned, as I had to wipe up a spill and the paper towel was filthy. I also noticed a few stains on the sheet and comforter where I slept. We love Loon and will be back. This rental was cute, but definitely needed a bit more cleaning before being rented. Thank you for your comments. We've discussed with the homeowner and changed the cleaning company used for this home. Additionally, all comforters have been laundered and the new company will be keeping a closer eye on this. We're glad that you enjoyed the rest of the home and hope that you'll give it another try. Condo was very cute and comfortable. 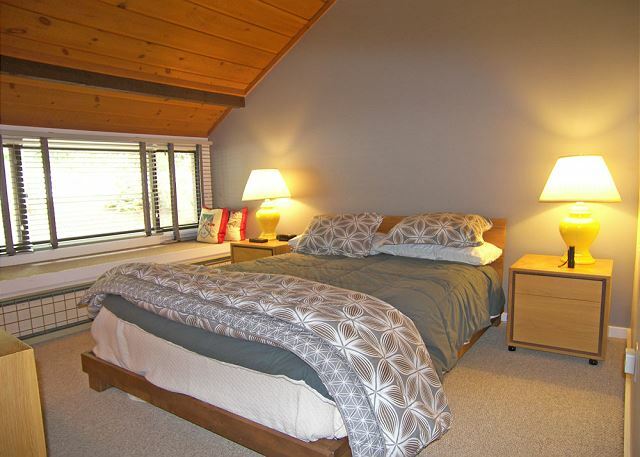 It has a nice layout and was very clean and well kept. Although it is a pet friendly unit, you would never know it. There were no odors or fur. The location is great for all white mountain activities. Right up the road there is a grocery store, restaurants (highly recommend Black Mtn Burger), an ice cream shop, winery, Hobo mini golf, Loon mountain, Alpine Adventures, the entrance to the Kancamagus highway etc. The unit has enough bedding to sleep 8-9 comfortably and had a gas grill on the deck (although we did not use it). The only negative was a couple of the beds seemed like the sheets hadn't been changed. Luckily we didn't need all the beds and I did bring it to the attention of the management company to talk to their cleaning people. We would definitely stay in this unit again. We greatly enjoyed our stay in the Village of Loon. The location was great, and the property was well-kept. The condo was the perfect size. The 2 bedrooms were a good size. 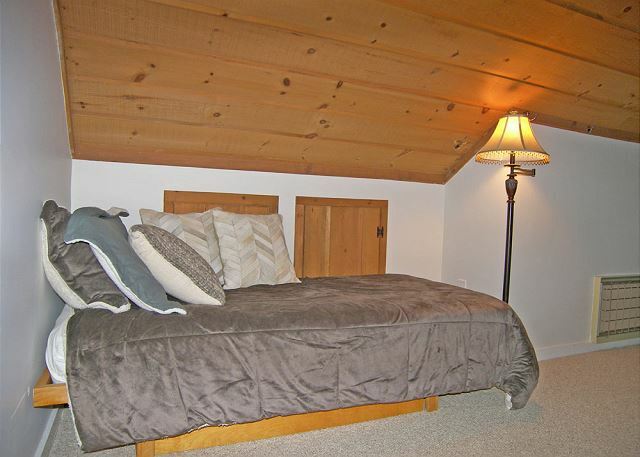 The loft was nice with the double bed and the twin bed. The kitchen was a bit small, but worked out fine. Very convienent to shops and restaurants and of course the Mountain. Would definitely rent this again. Allowing dogs was a big plus. My family stayed at the Village of Loon 14-2 over spring break. The condo was perfect for our needs. It was clean,comfortable and felt like a home-away from home. I would recommend this unit. The week we stayed was quiet during the week and we went to the mountain and excursions without any wait which was perfect. I would recommend this time of year. We are hoping to rent the same unit in the future. We have a small dog and it met our needs as well. However I would let the owners know that when using the washer and dryer to leave the door open, it is safer and gives ore ventilation. What a fantastic place for a family ski weekend. Plenty of room to spread out, shuttle to the mtn just feet away. Clean, efficient and had everything we needed. 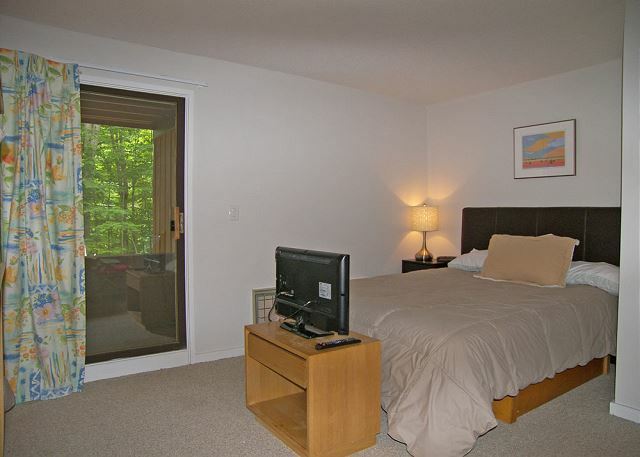 Great condo near Loon Mountain, easy to get to and located in a spot relatively quiet for the Village of Loon. This property is a dog friendly rental. It did not appear as though previous dogs had stayed there. 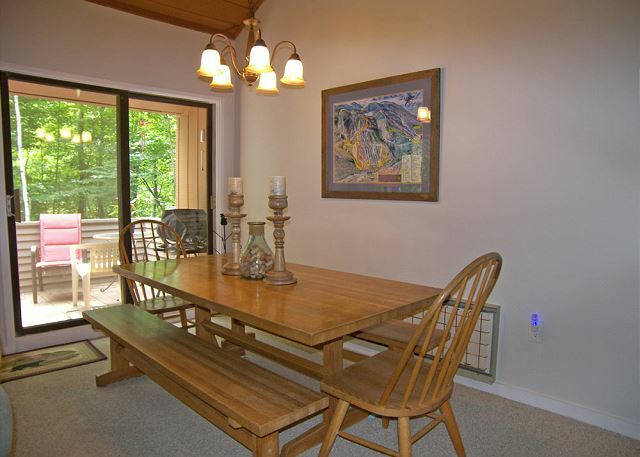 The property was clean and well located for day trips to the mountain venues. Maintenance was very responsive to minor issues.i would recommend One Love Brewery, Woodstock Brewery and Indian Head Resort as places to eat. Canon Tramway, The Flume are must do. Great place to vacation. Lots to do.